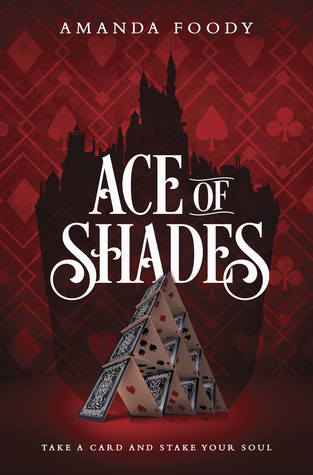 ‘Ace of Shades’ by Amanda Foody was fun. Synopsis: Enne is a lady. However, that doesn’t matter when she goes to New Raynes, the City of Sin, in search of her missing mother, Lourdes. Despite being armed with her mothers rules and a guide book, Enne is hopelessly out of depth. To find Lourdes, Enne sets out on an epic journey across the city where she meets gang lords, dances with death and discovers the truth about herself. In a city where no one wins, you have to play not to lose. The City of Sin reminded me of Ketterdam a little bit. It’s seedy, there’s trouble round every corner and you have to be street wise to survive. I’m a huge fan of places like this in books. I think it gives the characters a lot of space to play with multiple outcomes. I didn’t really get the Shadow Game part. I am terrible with any sort of gambling and the only card games I play are ‘snap’ and ‘solitaire’ – not exactly the most difficult or adventurous. So it’s no surprise that the rules of the Shadow Game were well beyond me. However, I’m glad that the overall scene was confidently explained through body language and emotions, so I wasn’t completely lost on the direction of the game. Enne is my homegirl. She’s a lady AND a lord. I mean, talk about over achieving! Nah, I’m messing. I liked that she started off quite proper and that her hunt for Lourdes slowly corrupted her into becoming the force she is at the end of the book. The way she sorted out some of the characters was very gratifying to read and I’m looking forward to her developments in the next book. I’m really hoping that her and Lola will become a gang of their own. I found Levi slightly difficult to like. Sometimes it felt like he was trying to be too much like Kaz (Six of Crows) but he fell horrendously short. We only saw small amounts of his card playing and it didn’t seem all that great yet he was supposed to be one of the best in the city. His gang hated him so much that he was challenged for his lordship and nearly lost. He didn’t have a great plan to get himself out of the mess and he relied heavily on another gang lord for guidance. I hope his character is better developed in the second book because Levi is not who Enne needs. This is a great book and the overall plot is well thought out. There are enough threads loose at the end to keep you interested as well as new directions for the characters to go in. But, some of the characters needed a little more thought and I think you need an average card game level of understanding to get the rules of some of the games. I enjoyed it though and I will read the sequel. I received this in Owlcrate’s April ‘Shadows and Secrets‘ box.